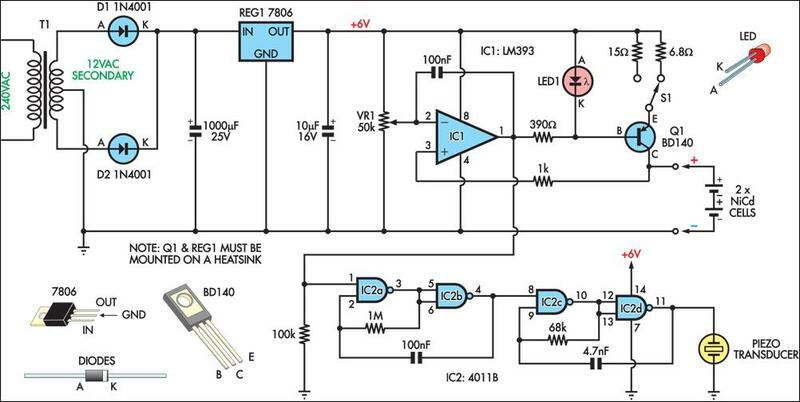 This circuit charges two NiCad cells with a constant current and features dual charging rates, voltage cutoff and an audible alarm. The circuit is powered by a 12VAC centre-tapped mains transformer, together with two rectifier diodes (D1 & D2) and a 1000mF filter capacitor. 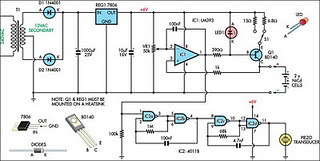 A 7806 3-terminal regulator is used to generate a 6V rail for the remainder of the circuit. Transistor Q1 and LED1 constitute a basic constant-current source. The forward voltage of the red LED (about 1.5V) minus Q1’s base-emitter voltage (about 0.6V) appears across the 6.8W or 15W emitter resistors, depending on the position of S1. With a 15W resistance in the emitter circuit, the charging current is about 60mA, whereas with 6.8W it is about 130mA. This is sufficient to charge 600mAH "AA" cells in 14 hours and five hours, respectively. An LM393 voltage comparator (IC1) is used for the voltage cutoff function. Its inverting input is set to 2.9V (nominal) via trimpot VR1, while the non-inverting input senses battery voltage. This means that while the cells are being charged, the output transistor (in the LM393) is switched on, also switching on Q1 and enabling the current source. Once the cells are charged to approximately 80% or more of capacity, their terminal voltages will exceed 1.45V, so the voltage at the non-inverting input (pin 3) of IC1 will exceed the reference voltage on the inverting input (pin 2). This causes IC1’s output to switch off, in turn switching Q1 off and disabling the current source. To prevent rapid switching action around the voltage cutoff point, a 100nF capacitor provides feedback between the output and inverting input of the comparator. Four NAND gates are used to build two simple oscillators of different frequencies. When cascaded together, the result is a pulsed tone from the piezo transducer to indicate charge completion. Absolute terminal voltage is not always a reliable indicator of Nicad battery charge state. Importantly, batteries should never be charged for longer than the manufacturer’s specified period.